The survey was conducted from Oct. 17 to Nov. 2 with 188 registered voters selected by chance from the Oconee County voter registration list. Students in a graduate social science research methods class conducted the interviews, mostly by telephone. The students were enrolled in a class I teach in the Grady College of Journalism and Mass Communication at the University of Georgia. The students conduct a survey in the class to learn about survey techniques. Strictly speaking, the survey findings only apply to registered voters. Oconee County has a very high rate of registration, however, suggesting that the results would apply with only minor adjustments to the population of persons 18 years old and older in the county. The findings also are dated, but no major issues have arisen in the county since last fall and the local and national economies have not changed markedly. 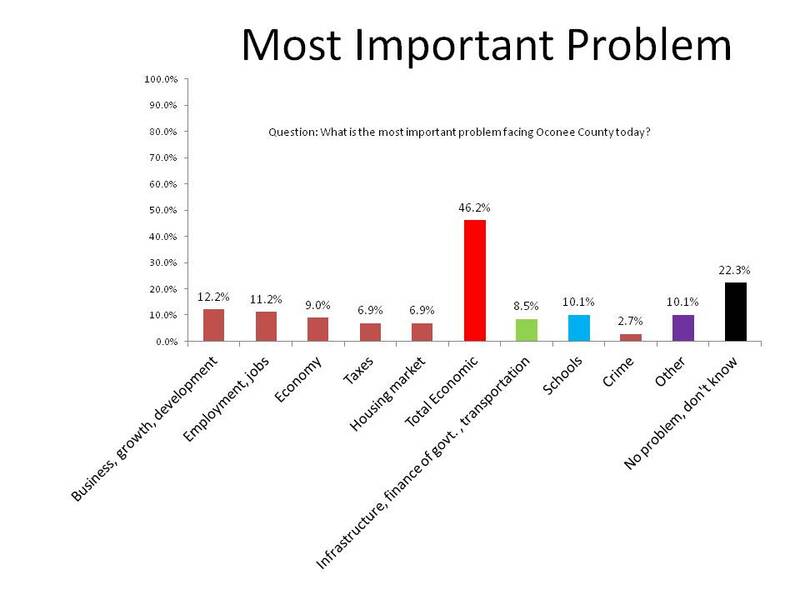 It is unlikely responses to the question on the county’s most important problem would be very different today. 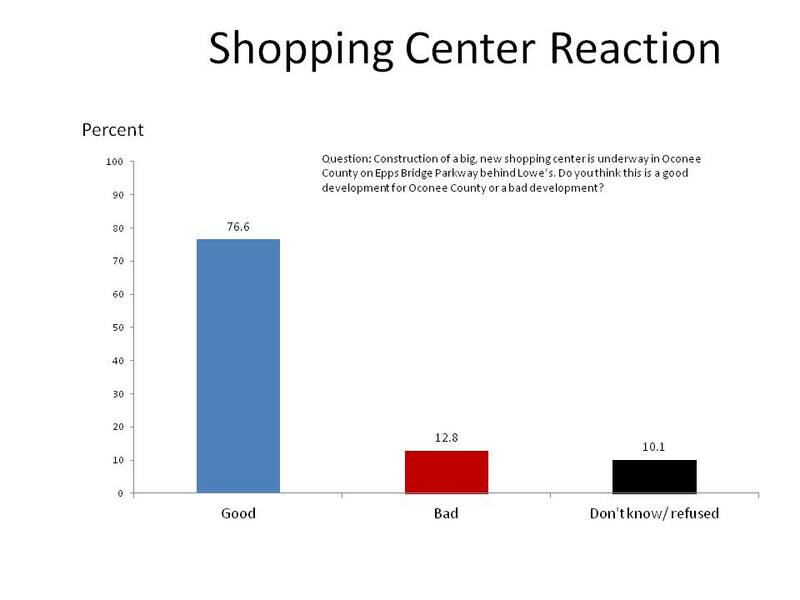 The survey also found that the vast majority of Oconee County voters think Epps Bridge Centre, the major new shopping center under construction on Epps Bridge Parkway, is a good development for the county. The respondents happy with the center cited increased tax revenue and jobs as the reason, and some mentioned better shopping options. Those opposed cited traffic and environmental concerns. These were the only two questions on the survey, which took about 15 minutes to complete, that dealt explicitly with Oconee County. Students selected most of the questions they asked from national surveys that dealt with political and social issues broadly. 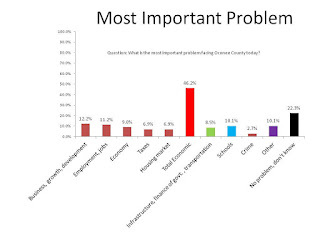 Respondents answered the question on the most important problem facing Oconee County in their own words. I looked for commonalities and classified responses into broad categories. Economic issues broadly defined accounted for 46.2 percent of the responses. This included concerns about business, growth and economic development (12.2 percent), employment and jobs (11.2 percent), the economy generally (9.0 percent), the local housing market (6.9 percent), and taxes (6.9 percent). “Jobs–creating more of them,” one voter said. “I really hate that there are so many subdivisions with huge, cheaply-built homes that are just sitting completely empty,” another respondent said. An additional 8.5 percent of the respondents mentioned infrastructural problems such as roads, water and financing of government. Some responses just did not fit easily into categories. I classified these as “other” responses in the chart. The survey results can be expected to match those of the whole population of Oconee County voters within plus or minus 7.1 percentage points. The odds are 19 to 1, for example, that the percentage of voters in Oconee County listing some sort of economic problem as the major problem facing the county is between 39.1 and 53.3 percent. Three-quarters (76.6 percent) of the respondents said the new shopping mall, Epps Bridge Centre, is a good thing for the county. Only about one in ten (12.8 percent) said it was not. “Taxes will come here,” another said. “We don’t need Hooters or movie theaters,” a critic said. In conducting the survey, the students selected 760 registered voters randomly, that is, by chance, from the 23,899 registered votes on Sept. 29, 2012. Voter lists contain names and addresses, and the students looked for telephone numbers and email addresses using online directories. In the end, students completed interviews with 24.7 percent of those 760 selected registered voters. Of the 188 interviews the students completed, 149 (79.3 percent) were completed via telephone. Others were completed in person, through the mail and online. It is possible to compare some known characteristics of Oconee County voters with characteristics of the 188 persons interviewed as a way of testing for bias in the sample of 188 respondents. The voter list includes race, gender, year of birth, precinct and State House District of each registered votes. The characteristics of the sample of 188 persons interviewed closely matched those of the overall population of voters on each of these characteristics. Overall, 86.7 percent of Oconee County voters were White, for example, and 87.2 percent of the 188 persons interviewed were White. Just more than half of the registered voters were female (52.5 percent). Of the 188 voters interviewed, 55.9 percent were female. Among registered voters in the county, 20.9 percent were between 18 and 29 years of age. In the sample of 188 voters, 19.1 percent were between 18 and 29. The close match of the sample with the population on these known characteristics does not guarantee that a match would exist between how respondents answered the survey questions and how all voters would have responded had they been interviewed, though it suggests that would have been the case.